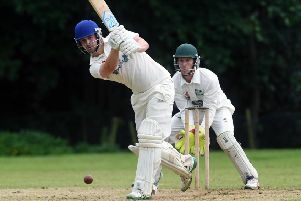 Many of the weekend’s York Senior League fixtures fell foul of the weather in round seven, including promotion-chasing Studley Royal’s Premier Division clash with Hull Zingari. One of the few matches that was completed took place in Galtres Division Two at Rowntrees & Huntington where the Ellis brothers took centre stage for Pannal. Andy Ellis smashed 143 not out in an unbeaten 216-run opening partnership with sibling Rob, who made 73 not out. Their partnership took only 27 overs as the visitors declared to try and pick up back-to-back wins following their maiden season victory on Bank Holiday Monday. However, the 39 overs they had to bowl their hosts out proved insufficient and Rowntrees finished on 160/7 despite a brace of wickets apiece for Carl Wilson and Rob Smith. Despite being unable to wrap things up, Pannal still ended the afternoon with a more-than-useful 26-point haul. Knaresborough 2nds did managed to complete a victory when they entertained Thorp Arch & Boston Spa 2nds in a Division Three clash reduced to 25 overs. Mike Core was in good touch and struck 60 for TABS as they batted first and put 141/7 on the board. This score proved to be competitive as the home team lost seven wickets in reply and needed 24 overs to reach their target. Important contributions once again came from a sibling duo, Tom Baines striking (31) and Sam Baines (30). 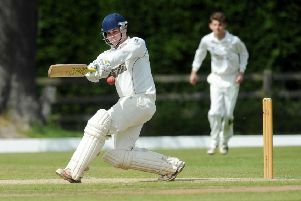 In Division One, a knock of 36 by George Owram helped Harrogate 2nds to 158/6 at Sheriff Hutton Bridge, but rain meant that no further play was possible. Knaresborough’s trip to bottom-of-the-table Hornsea was also abandoned with the hosts on 135/4, Graeme Whiles having claimed three wickets. Elsewhere, not a single ball was bowled when Mike Ainsley’s Ripon visited Heworth.